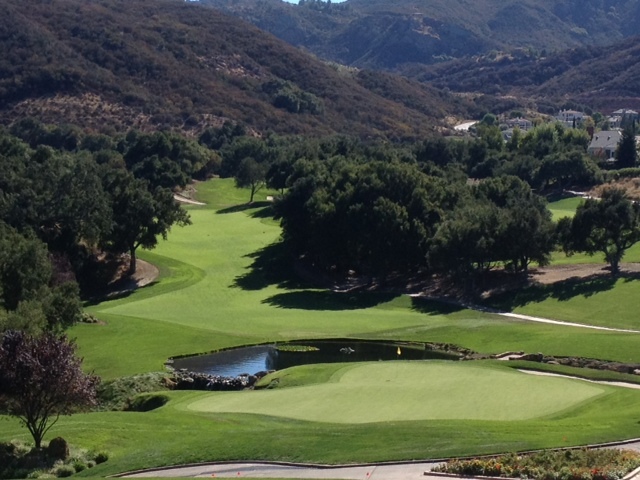 What you see above is the view that greets you after you walk through the clubhouse at Sherwood Country Club. This is the green view of No. 18. Seeing Torrey Pines for the first time and seeing Sherwood rank as my most memorable California golf course first impressions. At Sherwood, you can’t help but just stand there, take in the scene and then begin to contemplate what it’ll be like walking down that 18th fairway. And then when you do it, it completely delivers on the experience. No. 18 could well decide the tournament on Sunday as Tiger takes a two-shot lead into the final day of the final World Challenge at Sherwood, where Woods will seek a sixth title. I’ve thoroughly enjoyed watching this event on TV the past three days and found especially entertaining the travails the field had at the par-3 No. 15 on Saturday (11 balls in the hazard, making it the course’s toughest hole). No. 18 doesn’t seem to trouble the pros too much, despite a tight tee shot. Tiger in particular has been content to fly a 3-wood to 160-170 yards or so and play from there. But the second shot is what makes this hole so memorable. What golfer wouldn’t want to be looking at this for a second shot? Isn’t this the challenge we all live for? It’s about as pretty as it gets, but daunting as well. The day I played, my drive found the right rough of the fairway. I had a clear shot at the green, but I was very leery of the water. The last thing I wanted was to execute the drive and then rinse my approach. So I clubbed up and hit a fabulous 4-iron that carried to the back of the green. It was a club more than I needed, but I was dry. That approach shot replays in my head every time I see the 18 green on TV. Yes, it was one of those shots. From the replays, I expect the pin position to be in front today, as it was the day we played. That left me a super slick downhill that I mishit and then I lipped out my par putt. Oh, well. Being on in regulation was one satisfying feeling and rates among my better golf accomplishments for the year. But enough about me. Let’s give credit here to the designer, Jack Nicklaus, and his fabulous creation. Check out sherwoodcountryclub.com’s hole description to gain a little more appreciation for No. 18. Nicklaus calls the 444-yard par-4 eighteenth hole the finest finishing hole he has ever created. The tee shot is blind and must be played down the left side allowing the left-to-right slope to take the ball to the middle of the fairway. A mid-to-long iron approach awaits. The second shot must be played to a multi-level green that presents an extremely visually intimidating shot. The green is protected in front with a rock-filled pond that flows into a waterfall on the right and is connected to another waterfall and stream on the left leaving very little room for error short of the green. There is also a bunker on the left that will catch balls that are missed slightly left. 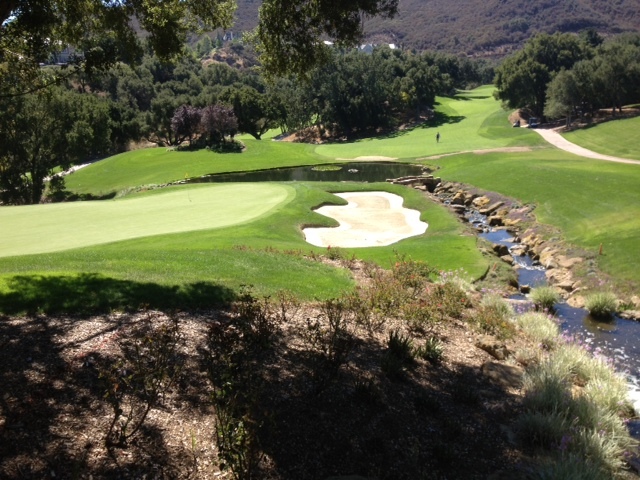 The back right portion of the green is protected by the waterfall, a deep pot-bunker, and a deep grass-bunker. Most shots left short of this green find the water, but balls over the green face a chip or pitch from the deep rough to a green sloping away from the player, taking the shot right back toward the bunker and water. This is truly a classic finishing hole that ranks as one of the finest in the world. I’ve hardly played everywhere in the golf world, but I don’t know of a finishing hole I’ve played that rates above it. So take a minute to appreciate No. 18 today and lament that we might not see it on TV again. It’s a masterpiece to play and a wonder to watch and a hole that can’t help but make you love this great game just a little more. This entry was tagged Jack Nicklaus, No. 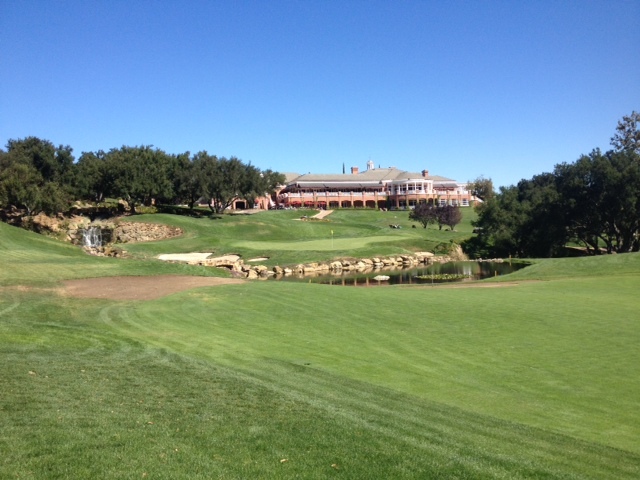 18, Sherwood Country Club, Tiger Woods, World Challenge. Bookmark the permalink.